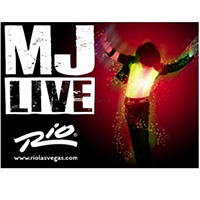 If you’re a fan of Michael Jackson, then you’re going to love MJ Live at Rio Las Vegas. Enjoy all your favorite MJ hits, all on one stage. Plus, the tribute artist’s falsetto and Moonwalk are sure to give you goose bumps. MJ Live features all the King of Pop’s biggest hits, including “Bad,” “Billie Jean,” “Beat It,” “Dangerous,” “Smooth Criminal,” “Black & White,” “I Want You Back” “Thriller” and more. This Las Vegas show recreates the legendary superstar’s energy and excitement. The sound quality, lighting and visual effects – along with the tribute artist’s spot-on impersonations – certainly comes close to an actual Michael Jackson concert. MJ would be proud. Remember, the livelier the crowd, the more fun this Las Vegas show will be. Photos and autographs are available after the show. See MJ’s signature moves including the moonwalk, experience an intimate theater makes show come alive, sing and dance along, surprising end during “Thriller” number, observe how much impressionist looks, acts, walks and talks like the real MJ.